Located in the heart of the popular region of Costa Brava in Spain, Neptuno is a family-friendly campsite surrounded by nature. Stay in an on-site mobile home, luxury tent or bungalow tent, each fully-equipped with modern amenities, and enjoy the ultimate camping experience. Book now with LUX-camp and take advantage of some superb deals and low prices. With so much to offer both adults and children, this campsite is one of the best in the region and promises visitors a camping holiday to remember. With glorious sunshine and a Mediterranean climate, this luxury camping site is ideal for those who want to relax and soak up the sun. 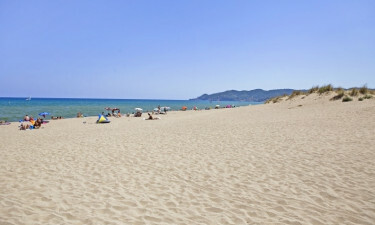 With Pals Beach situated very close to the campsite and a decent sized swimming pool boasting a waterslide within the grounds, there are plenty of opportunities to sunbathe whilst keeping an eye on the kids. There is a small paddling pool where toddlers can splash about safely and there are many deckchairs and sun-loungers surrounding the pool areas. 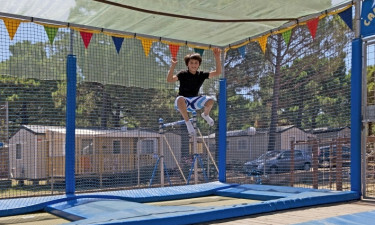 There are many activities to choose from whilst camping at Neptuno, leaving the kids no time to get bored. From tennis and volleyball to swimming and cycling, this camping site has something for everyone to enjoy. Bike hire facilities are available on-site, making it easy for the entire family to enjoy a day out exploring the beautiful surroundings. Venture outside of the grounds for fantastic golf courses and watersport activities such as sailing, surfing and scuba diving. The campsite itself has an exciting entertainment programme ranging from sports tournaments and competitions during the day to theme nights and karaoke in the evening. With an on-site fitness centre boasting the latest exercise machines and a heated indoor pool, adults can relax in peace whilst the children play on the trampolines or run around on the sports fields. Soak in the thermal baths or the hot tub, located near the outdoor pool, and watch the children enjoy themselves in the sunshine. There are even several massage and beauty therapies to choose from for an added touch of indulgence. With the fresh aromas of the surrounding pine trees and the peaceful atmosphere of this outstanding campsite, it is no wonder why visitors return to Neptuno year after year. 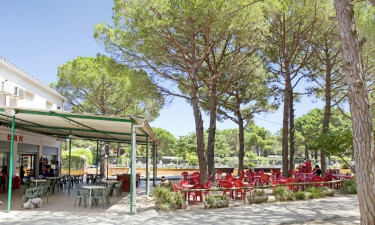 There is a restaurant, several snack food outlets including a pizzeria, a bar with a large terraced area and a takeaway service available from within the campsite. Barbecues can also be rented on-site. For a wider selection of restaurants and cafes, venture outside of the grounds and explore the small villages that can be found in the vicinity. Fresh bread is always available on-site and there is a small supermarket where campers can buy groceries and other necessities. There is also a larger supermarket within easy travelling distance from the campsite.